Top ranking NSW Sydney Secondary Schools (Non-government and Private) for the year 2017. The result is a combination of both year 7 and 9 numbers from NAPLAN. One thing to note is some schools listed have very low enrolment number so the result is possibly not a reliable reflection of the entire school’s performance and historically can have big fluctuations as well. This is why I also included the enrolment number here, some school got big enrolment number as well due to they are classified as combined with both primary and secondary components counted together. One more thing to note is that the percentage is based on the number one primary school regardless of school sector Australia wide. Just so to be clear that the particular school is James Ruse Agricultural High School for the year of 2017. Top ranking NSW Sydney Secondary Schools (Government and Public) for the year of 2017. The result is a combination of both year 7 and 9 numbers from NAPLAN. One thing to note is some schools listed have very low enrolment number so the result is possibly not a reliable reflection of the entire school’s performance and historically can have big fluctuations as well. This is why I also included the enrolment number here, some school got big enrolment number as well due to they are classified as combined with both primary and secondary components counted together. One more thing to note is that the percentage is based on the number one primary school regardless of school sector Australia wide. Just so to be clear that the particular school is James Ruse Agricultural High School for the year of 2017. Top ranking NSW Sydney Secondary Schools (Government and Non-government) for the year of 2017. The result is a combination of both year 7 and 9 numbers from NAPLAN. One thing to note is some schools listed have very low enrolment number so the result is possibly not a reliable reflection of the entire school’s performance and historically can have big fluctuations as well. This is why I also included the enrolment number here, some school got big enrolment number as well due to they are classified as combined with both primary and secondary components counted together. One more thing to note is that the percentage is based on the number one primary school regardless of school sector Australia wide. Just so to be clear that the particular school is James Ruse Agricultural High School for the year of 2017. How is the Easter Holiday for your guys, I have had a good one and came back refreshed. Today’s topic is something the parents from the local communities are well aware of. To refresh what is happening, Artarmon Public School has been the first or second ranked Public School at primary level in NSW for a number of years now. This fact combined with significant development in new dwelling within the school catchment area caused a massive surge in the school enrolment number. What the Department of Education doing is bringing demountable classrooms to accommodate the increase in enrollment number. Last time I visited Artarmon Public School, there are close to 20 classrooms plus various of facilities with demountable style hall and other facilities hosted in them as well. Sufficient to say it is one of the most crowded school I have visited in Sydney. You can find more pictures and information in the two blog entries I did for Artarmon Public School previously. 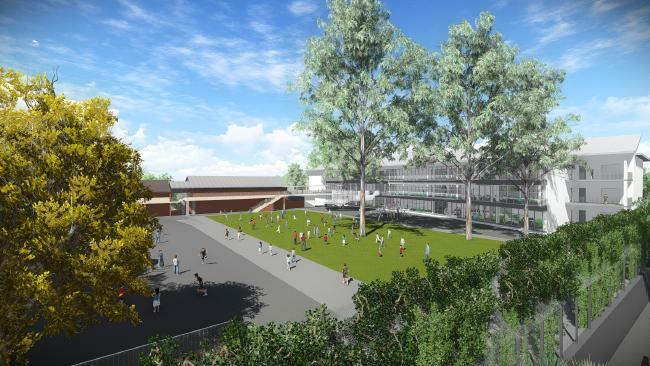 Following is the project overview for the proposed upgrade for Artarmon Public School. More continuous and functional open play space (anticipated completion early 2019). The complete project is due for completion in early 2019. On completion of the project, students currently residing in the Barton Road Campus will be transferred back to the McMillan Road Campus and the temporary school will be decommissioned. There is a bit of back and forth with the proposed upgrade, the original plan was modified last year and the school hall part of it got axed. There was a pretty significant local community backlash for this change. The good news is that Department of Education has listened and original plan has been reinstated which is really great and secures the short to intermediate future for the school. However in the long term, there still possible catchment shrink with more new public school coming online in the North Shore area to future relief the enrollment pressure. I have come across this interest information on the NSW Department of Education website. There are tonnes of good information and rather interesting one as well. First on where this score coming from by directly quoting the NSW Department of Education. Entry into these schools in Year 7 is determined by the students’ results in the Selective High School Placement Test in English (including reading and writing), mathematics and general ability, together with their primary school’s assessment of their performance in English and mathematics. Other evidence of academic merit may also be considered. Second some quantitative information, there are 17 fully and 26 partially selective high schools in NSW with majority of them located in Sydney which is not surprising given that most of the NSW population resides in Sydney. In additional to those schools, there are also 4 additional agriculture high schools which are also selective high schools as well. There is also a virtual selective high school as well. In 2016 there were 4215 vacancies in all selective schools and 13118 applicants, so basically only 1 in 3 applicants got into the selective school. Not a surprise which schools sits at top of this list. I probably will do another follow up blog entry to go into details on some of the specifics. Anyhow I thought this is something fun and interesting to share with everyone. One of the eternal question that get asked all the time is how does the school rank and how do they compare with each other. The primary source of the school information come from the relative newly minted myschool.gov.au that came out during the Julia Gillard’s labor government period. This site is absolutely monumental for someone like me, for the first time in ever I had access to just a wealth of information. However now the question is how to interpret all these data and make sense out of them. We first need to understand ICSEA commonly being mentioned, official definition as following, in simple term higher the number more Socio-Educational Advantage a school has from the prospective of the Department of Education. In using the Index of Community Socio-Educational Advantage (ICSEA) calculation to describe school populations on the website, the median value of all schools’ ICSEA values is set at 1000. This represents the ‘middle ground’ of educational advantage levels among Australian school students. The median is used because the ICSEA values of all schools are unevenly spread, reflecting the great diversity of student populations across Australia. Most of stats on the site will compare with schools with similar ICSEA and another with all schools. One brief look at a single school such as Summer Hills Public School will show that it is only compared with 57 other school and ten of which is actually public school from NSW. Another thing with Summer Hills Public School is that it hosts OC classes for the local area as well, so the number for the year 5 are artificially inflated by this factor as well. What this means is that the raw result of year 5 of a school that host the OC classes can give a false impression of what general performance level. It appears what myschool.edu.au gives a straight up measurement of number on above five which is possible to measure the schools against each other. However given the number of the schools in Sydney alone, let alone NSW and entire Australia, this is a mammoth task indeed. There is no really a good way of mashing up the measurement from different year and also account for things like OC classes etc to extract a true general level of performance for a school. I will try to do a sample comparison on two schools to illustrate the difficulties in comparing the results. It is actually very interesting how concentrated the top public schools for NSW are located. 91 out of the 100 top public school are located in Sydney two of which are special schools, 2 in New Castle, 1 in Wollongong, 1 in Central Coast and 5 in country NSW. To give some prospective in pure population wise, 62 percent of NSW population lives in Sydney, however 89 percent of top 100 state’s public schools are in Sydney. The concentration is even higher when you looking at the top 50, 46 out of the top 50 state’s public school is in Sydney for the year 2014. There is another top 50 that is located in Sydney which not included in the count that is the Sydney Distance Education Primary School. If you lived in Sydney for any period of time, you will likely know that there are a lot of good schools in the northern Sydney. 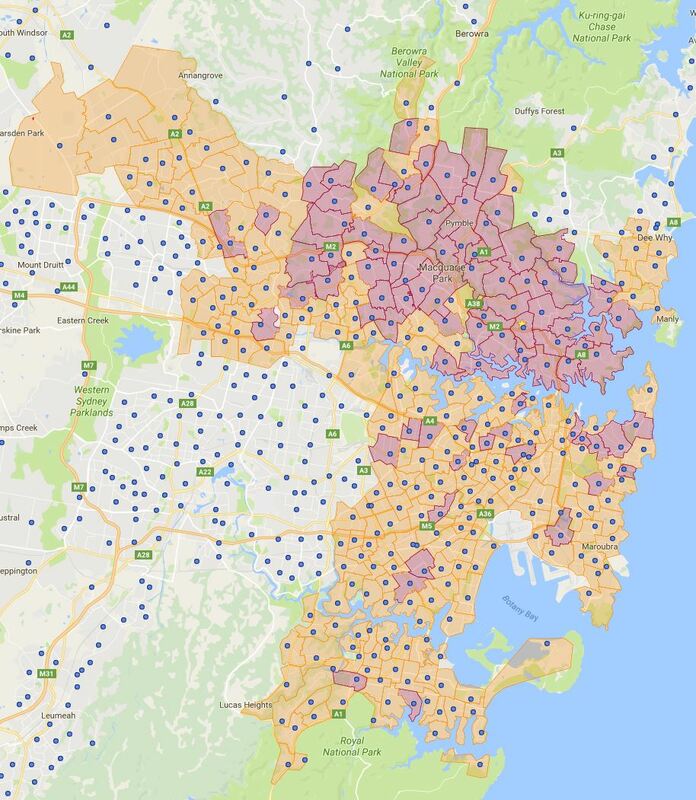 I was still a little surprised once the top schools are mapped out and how concentrated they are in the northern Sydney. 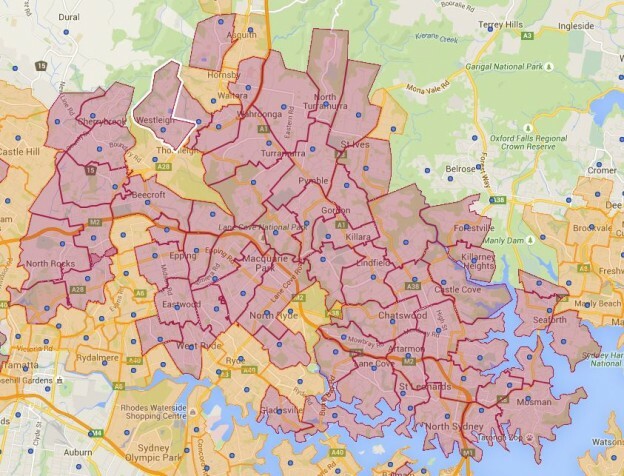 As you can see from my top 50 Sydney NSW public school catchment map that only 6 out of the 46 Sydney’s top public school is located outside of Northern Sydney. First I want to mention that the breakdown of region is approximate as there is really no exact definition which suburb belong to which Sydney regions. Number of Public Schools in each respective Sydney area that are in top 50 in NSW. Another interesting point to note when looking the stats is that Western, South Western Sydney and Shire district are not represented in the list at all. 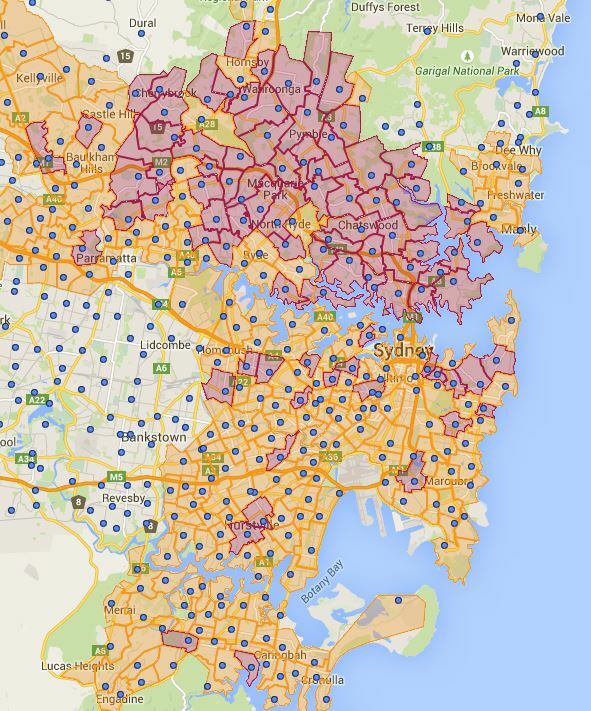 This is the number of Public Schools in each respective Sydney area that are in top 100 in NSW. South western Sydney is again not represented at all, Western Sydney and Shire district only have marginal presence in the list. What is also interesting to note is that just about every suburb is North Shore and Northern Suburbs are represented in the top 100 list. This is also why in my opinion picking a school is not as important when you are buying properties in the North Shore and Northern Suburbs, because just about every local public school is very good. I may do a follow up entry in the future to do some further analysis on why the concentration of good public schools in North Sydney. If I get time I will try also collect some other stats to facilitate this. 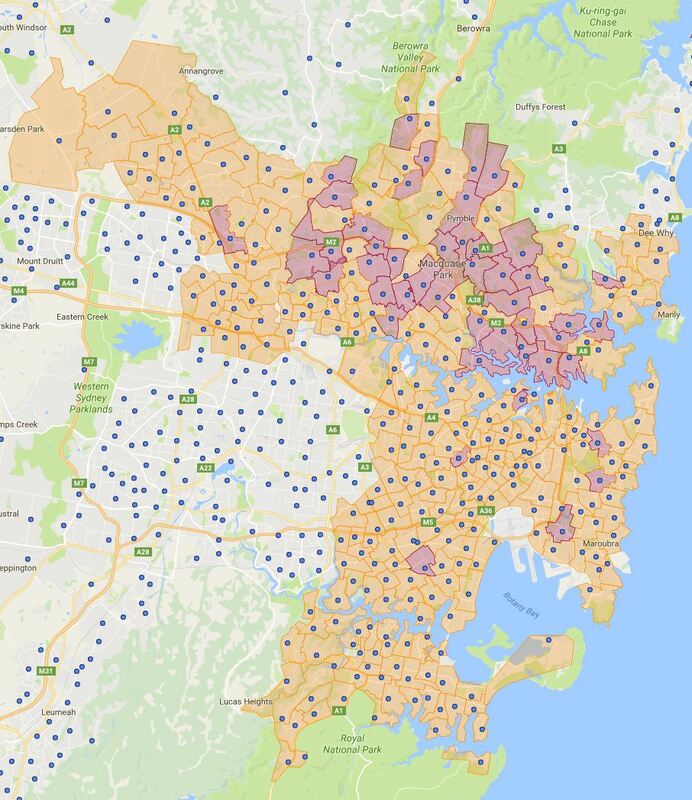 This is a follow up of the last map showing the top 100 NSW public school in Sydney. I hope your guys enjoyed it as much as I had. I will do a brief analysis entry on the two maps which just got created. Looking at the maps visually certainly reinforced a lot what we know already. For reference there are 11 out of 100 not mapped, two of them are special type school with catchment defined. So this entry added additional 42 schools to the 47 of last entry. There is only one top 100 school in Sydney that there is no catchment map already created for it. Ranking is obtained using information from bettereducation. I am a geek at heart and now that I am older, I have fully embraced the fact. I always have great interest in public education and like many people lived Sydney already know rough where the top state public schools are located. However knowing roughly is different from looking at the exact locations on the map. 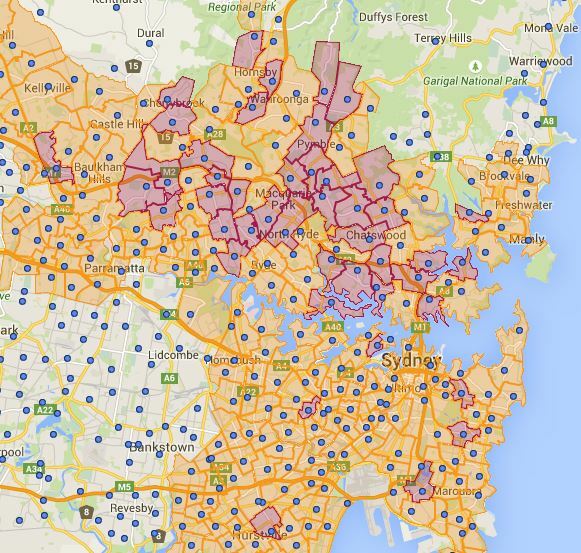 With 300 Sydney public school catchment completed recently I have a good base to draw this data onto. Without further ado, here is the promised fun work for your guys to enjoy. Check out the top 50 Sydney NSW public school in map. There are only 3 odd ball out in the top 50 list, with one being the Sydney Distance Education Primary School and other two located outside of Sydney and yet to be mapped. The other 47 are covered by the existing map already. I got some more mapping to do and will do a discussion of this in a future post.